Jiǎozi or potsticker is a Chinese dumpling popular in China, Japan ( known as gyoza) and North America and throughout the world. I've always wanted to try them but never had. So after looking through Gordon Ramsay 'World Kitchen' and finding steamed Chinese dumplings, I remembered seeing fried version of them. 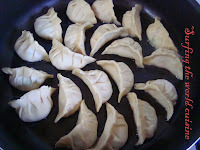 And once again our good friend google helped me and I came across an amazing site 'Use real butter.com' with wonderful instructions on how to make the dumplings and how to fry and steam them . It was very helpful and I highly recommend to read it carefully if you're going to make them the first time. For the dough I used Ramsay recipe but the filling wasn't completely Chinese. I used local ingredients but it turned out great and I'll definitely make again. 1. Mix the dough ingredients and knead for 10 min until silky. Then wrap in a fling until you prepare the filling. 2. Chop the cabbage and mix with vinegar and soya sauce. Mix it well and keep for 5-10 min. Then mix with ground chicken, add finely chopped ginger, spring onions, chilli. Add some pepper. Mix it well. 3. Divide the dough into 5-6 pieces and roll each piece. Take a wide glass and cut out circles. Add the filling, fold the circle with the filling in half and pinch in the middle. Then continue folding the edges to make pleats. Press hard so that it won't lose the shape. See the photos here. 4. Add 2 tbsp of vegetable oil to the pan with a lid. Place the dumplings. Put them on a medium heat. 5. When they start browning, very carefully and very quickly pour a glass of hot water ( hold the lid to protect yourself from the steam!) into a pan and cover it with a lid. When the steam stops and water starts bubbling, take the lid off and let the water boil out. The bottom of the dumplings must be crispy. 6. 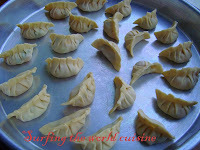 Dumpling are generally served upside down with soya sauce, vinegar and chilli sauce, garlic, ginder and spring onions. Enjoy!!! These look wonderful. 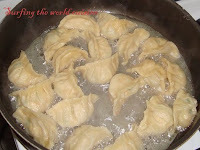 I have a houseful of folks who love dumplings and your recipe sounds wonderful. WOW, this recipe makes a bunch. Looks great. I haven't made the wrappers yet (always used store bought). I will have to give it a shot!